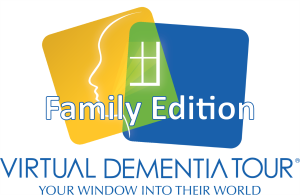 To help family members learn more about the challenges their loved ones with dementia face, we’ve developed the Virtual Dementia Tour Family Edition, a condensed version of the Tour that was designed specifically for use only in home settings. After experiencing the Family Edition, caregivers report increased sensitivity to the challenges faced by their loved ones with dementia, and often are able to make the needed adjustments to their care-giving… which results in an increase in positive interaction for all. A family guide, written specifically for family caregivers, is included to help care partners navigate the challenges that dementia brings. My mum had dementia and Alzheimer's over the past few years and actually died of it just a week ago. She used to love listening to me play the violin and would ask me to but whenever I began she would immediately lose interest. As a result of the show, where it was explained that you lose the ability to filter out background sounds, I bought an electric violin and played to her over headphones, the idea being to block out the background noises. Amazingly enough, she was very happy wearing the headphones, and began moving her head to the music whenever I played. I thought you may find this useful.